Dress up your starter or side dish! 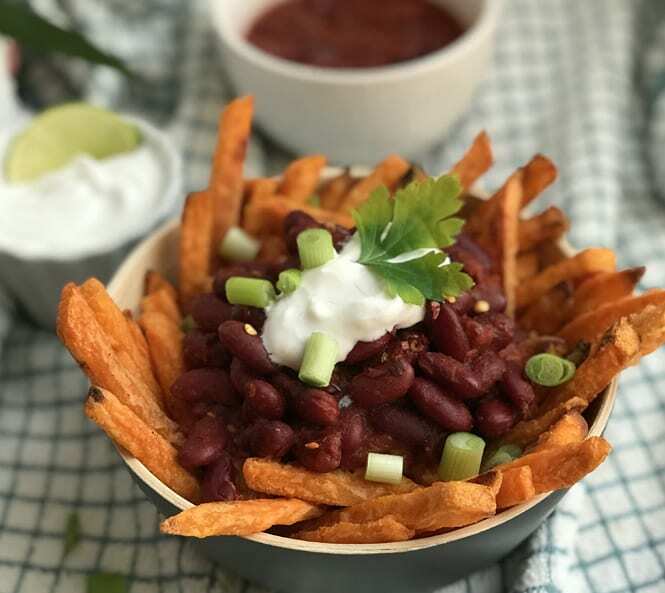 Our Oven Baked Sweet Potato Fries are the perfect base for the simply flavourful chilli made of kidney beans, tomatoes, and herbs and spices. Top with your favourite coconut yogurt and a few spring onions to delight your guests with a dish that’ll keep them coming back for more! Preheat the oven to 200 °C, cook the Sweet Potato Fries as per instructions on the pack. Heat the oil in a saucepan on a medium heat. Add the red kidney beans and tomatoes alongside some of the reserve liquid from both. Mix in chilli powder, oregano, cumin, and cayenne and stir for 2 minutes or so. Bring chilli to boil, stirring occasionally. Reduce heat to medium-low and simmer until flavours blend and chilli thickens, stirring occasionally for about 15 minutes. Mix 2-3 tablespoons of coconut yogurt with the juice of half a lime. Arrange the sweet potato fries in the bowl, adding the chilli on top. Finish with a dollop of coconut lime yoghurt some spring onion and coriander.